There’s been a faithful attendant at the Cathedral of St. Ambrose in Vigevano, Italy. Since the church opened in 1660, someone’s been to every service. It’s not a priest, or a saint. It’s not even human. It’s a dinosaur skull. 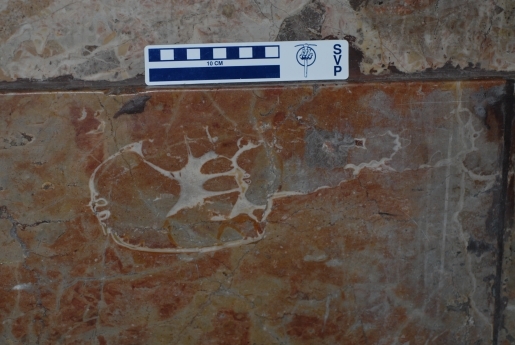 A paleontologist discovered that within the pink marble rock used to build the altar at St. Ambrose is a 12-inch-long dinosaur skull, cut into segments and buried within the church’s decoration. As for the type of dinosaur, that’s unknown. The broccatello was mined in a fossil-rich area called Mount San Giorgio, a UNESCO World Heritage site due to its many fossil discoveries. Dr. Tintori hopes to use 3D imaging to uncover the type of dinosaur that’s been faithfully attending church for 350 years.